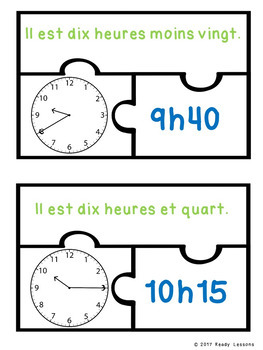 French Telling Time in French to 5 Minute Puzzles Francais Quelle heure est-il? Looking for a fun teaching idea for telling time in French? 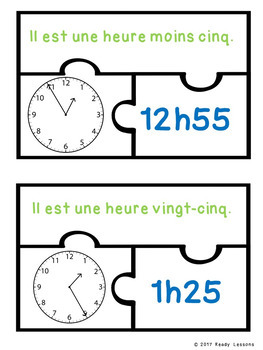 Well look no further as French Telling Time to 5 Minutes Puzzles, will serve as an exciting lesson. This is a great resource to incorporate into your unit as a guided math center rotation, review exercise, small group work, morning work, remediation, intervention or rti. It can also be used as a quiz, drill, test, or assessment tool to help determine student mastery of the learning target. Whether a student is homeschooled or given this as a homework assignment, kids will also love working on these at home to improve their skills. This puzzle set includes 32 colorful jigsaw puzzles, answer key, and an optional station instruction page with an example. These come as pdf printable sheets that can be printed on card stock and laminated for long-term use. As a suggestion, store them in a sealable gallon storage bag and place them in a tub or bin for students to use throughout the year for enrichment when they finish early. Another idea, for a project, is students can glue the completed puzzles into a notebook or journal as a reference sheet. They can also be glued on a poster for displaying on a bulletin board or as a wall anchor chart. By matching the puzzle pieces with the time in word form, digital form, and on an analog clock, students can gain confidence in an important and sometimes challenging skill. 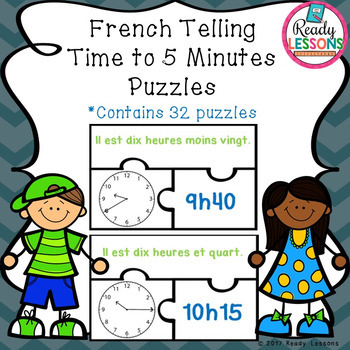 Your students will love to practice and learn to develop strategies about telling time to the nearest 5 minutes in French! I hope you download and enjoy this engaging hands-on manipulative activity with your students! So set those worksheets aside and give our puzzles a try! Remember to leave product feedback to get TPT credits towards future purchases. Also remember to follow my store by clicking the green star next to my logo for the latest product releases and freebies.